Who are the real winners and losers in the USMCA deal? Canadian consumers are among the biggest winners in the new USMCA deal, according to a researcher who focuses on international trade. “In terms of dairy, wine, the de minimis threshold — I mean, it was all in the right direction in terms of easier access to goods and services abroad, lower prices and greater variety for the Canadian consumer,” said Christine McDaniel, a senior research fellow at George Mason University. The de minimis threshold for duty-free shopping — the amount that Canadians can buy in the U.S. and bring back across the border without having to pay a duty — increased from $20 to $150. The new deal — set to replace NAFTA — has been criticized by the steel and aluminum sectors for not removing U.S. tariffs, but praised by the auto industry for stopping those same tariffs affecting them. The dairy sector is disappointed over concessions made to push the deal through, while the government has been praised for preserving the independent dispute resolution mechanism. Colin Robertson, a former Canadian diplomat who helped negotiate the Canada-U.S. Free Trade Agreement, and later NAFTA. He is now vice-president and fellow at the Canadian Global Affairs Institute. Antonio Ortiz-Mena, an economist who was part of Mexico’s negotiating team when NAFTA was first drafted. He’s now senior vice president at Albright Stonebridge Group, which provides strategic trade advice. VOICE: I’m looking forward to signing this agreement with Presidents Trump and Pena Nieto. And I really would like to stress this will be good for workers in all three of our countries. 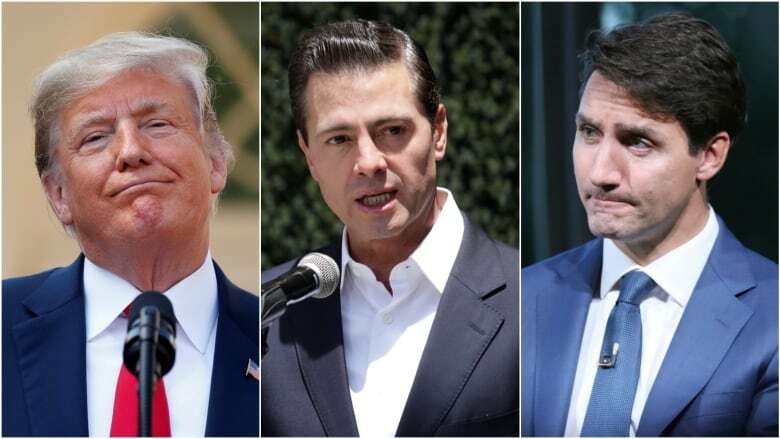 AMT: There are wins and losses in the new US-Mexico-Canada agreement. Whose wins and whose losses? We’re asking. I’m Anna Maria Tremonti. This is The Current. VOICE 1: When the Prime Minister offered to renegotiate NAFTA, there were no sunset clauses, steel tariffs or auto quotas. And we already had a dispute resolution mechanism. So these are not new gains in this deal. So we had hoped that the government might negotiate gains for Canada, like an end to the buy America policy that cost billions of dollars and thousands of jobs. VOICE 2: Canadians are pleased today that we are moving forward on a historic record that stabilizes, secures and offers certainty to investors to Canadian businesses, but mostly to workers and folks in the middle class. AMT: So was it a win for Canada or not so much? You heard Conservative leader Andrew Scheer and Prime Minister Justin Trudeau going back and forth there yesterday in the House of Commons over USMCA, the United States Mexico Canada agreement, is set to replace NAFTA. I’m joined by trade experts from all three countries to help tally up the wins and losses for all involved. Colin Robertson is a former Canadian diplomat who helped negotiate the Canada US Free Trade Agreement and later NAFTA. He is now vice president and fellow at the Canadian Global Affairs Institute. He is in Mexico City. Antonio Ortiz-Mena is an economist who was part of Mexico’s negotiating team when NAFTA was first drafted. He’s been head of economic affairs at the Mexican embassy in the U.S. He’s now senior VP at the Albright Stonebridge Group, which provides strategic trade advice. He’s in Washington, D.C. And for the U.S. Christine McDaniel is a senior research fellow at the Mercatus Center at George Mason University. Her research focuses on international trade and economics. She is also in Washington. Hi everyone. AMT: First of all, USMCA, is anybody calling you US-M-CA or anything like that? Like what are we calling it? CM: We’re calling it USMC. CM: We’re trying to out how to say it really quickly. AMT: OK. I’m going to go around the table quickly and just get a sense of what you see as the most important gain for each country. Antonio Ortiz-Mena, let’s start. Most important gain for Mexico, quickly. AOM: Quickly, the fact that there is a new agreement as opposed to just endless uncertainty, in general. Specifically I’m quite obsessed about dispute settlement mechanism. So I’m glad to see that there is a strong dispute settlement mechanism. I think apart from that everything is less important. AMT: Colin Robertson. Hello, Colin. Colin Robertson did we lose you? OK while we try to find him, Christine McDaniel very quickly, what do you see as the most important gain for the United States? CM: Well I think the biggest gain right now is just the sense of relief you know that we averted disaster. And you know investor confidence hopefully will be built back up you know to the extent it was sort of on the brink there. AMT: OK. Colin Robertson what do you see as the biggest win for Canada? CR: Well I think I agree with Antonio that dispute settlement mechanism, but importantly the market certainty. You saw the market track yesterday that we now have a deal in the kind of zombie NAFTA zone. That wasn’t good for Canada or Mexico. That having access now once again to the biggest market in the world is important for Canada. AMT: Colin Robertson, I want to ask you I’m looking at the CBC opinion page today. Neil Macdonald has a piece where he says that under this deal, if Canada wants a trade deal with China, it must signal its intent ahead of time to the United States. It must submit the text of any deal to the United States and then accept Washington’s verdict on that. CR: Well I think what it says is, if Canada has an agreement with a non-market economy and I think you’re going to get some dispute as to because China is a member of the World Trade Organization, but is it a non-market economy. But it’s not a clause I’ve seen before, others have commented on it, Peter Clark as well. We’ll see how what it means in application. AMT: And doe that worry you? Given that Canada the real push that came out yesterday from various sectors in Canada was to say Canada needs to diversify so it doesn’t end up on a precipice again. CR: No because I think what that there is pressure on China, Canada is part of that steel reduction and things to bring China more fully into how we trade amongst nations and I think the more likely you would see efforts to bring China into what we now call the comprehensive from progressive Trans-Pacific Partnership, which I think is going to become the benchmark for trade agreements in the Pacific. And Canada and Mexico are both members of that and I see that as more likely to be the new benchmark and the encouragement to bring China into that and China will have to take on certain obligations. AMT: Let’s talk about some of the losses. Colin Robertson, we heard some negative reaction from dairy farmers on concessions regarding U.S. access to the Canadian dairy market. Canada has says it will compensate dairy farmers. What are we looking at there? CR: Well if the United States had joined the Trans-Pacific partnership, we would have given the United States an additional three and a half percent 3.25 percent quota. Instead we’re now giving them I think something like 3.75 percent quota. We’ve given the Europeans about 3 percent quota. So 90 percent of the market is still very much in Canadian hands, so it’s a very small increase. And as you pointed out, the governments, provincial and federal, have offered compensation. We did something similar with the wine industry after the negotiations of the Canada-US free trade agreement and you know it really did turn around our wine industry. Now we sell Canadian wines all over the world. So I think rather than looking at it defensively, we should be looking at it the same way our beef and pork, our grains and our pulse, we we are world gangbusters. I don’t see any reason why our dairy producers and you think of the superb cheeses we produce, strictly out of Quebec, why we can’t turn that around and become real international competition as we are in other parts of the agriculture sector. AMT: Christine McDaniel, if Canada is going to compensate the provinces and the federal government, dairy farmers for any losses. Is that how does the United States see that, does that go against free trade? CM: Well that’s their prerogative to do. You’ll recall that the United States is doing something similar or are considering doing something similar on agriculture in terms of the effects on US farmers from retaliation from China and others. So you know as long as it’s within the WTO rules and you stay within those parameters then it’s the country’s prerogative to do that. AMT: And so what’s the reaction in the United States that this deal has given more access to the Canadian dairy market? CM: Well I think it’s positive. It’s definitely in the right direction. I think you know one of the bigger winners here are the Canadian consumers. You know in terms of dairy, wine, the de minimus threshold. I mean it was all in the right direction, you know in terms of you know easier access to goods and services abroad, lower prices and greater variety for the Canadian consumer. AMT: Let’s talk about wine for a minute. In BC, the wine industry is going to have changes because the winds have traditionally had exclusivity in grocery stores in the province. Listen to Karen Graham, a wine industry consultant. VOICE: For the BC wine industry it means a few different things. Some of them certainly today or by November 1, 2019 to be feeling the pinch a little bit in terms of increased competition on BC wine and grocery store shelves. AMT: Colin Robertson, there’s unhappiness on that front. What do you think? CR: Well this is an example of a kind of what we call non-tariff barriers. No nation is immune from protectionism and essentially what was being practiced in British Columbia was protectionism on behalf of the local vintners. Now again, I say BC makes a very good product. The BC wines are going to have to share shelf space with wines from the US and others. Something we really should have been doing under our NAFTA obligations. And this was sort of rectified in this agreement. I don’t see a problem because I think if you like BC wines, you’re still going to be seeing BC wines, but when you go in and you look at their shelf, you’re now going to have more choice. Yes, some of it is coming from the States, but you’re still going to have the BC wines there. It is up to the consumer to choose, which one he wants to get. And the fact we’re now in accordance with obligations we really undertook under the original North American Free Trade Agreement. AMT: I want to ask about the auto industry. Antonio Ortiz-Mena, how will changes in that sector impact Mexico? AOM: Well I think that the auto agreements are both a win and a loss for Mexico. I think they’re a loss because Mexico would have preferred to keep the original regional content rule of 62.5 percent regional value added. The fact that it went higher and that it has some wage related requirements means that the rules are pretty complex, they’re cumbersome and some companies might opt to trade under WTO rules, which only provide 42.5 percent tariff. And there’s also a side agreement whereby both Mexico and Canada have a guaranteed quota of 2.6 million autos to be exported from Canada or Mexico to the US, should the US impose new tariffs on autos, under national security laws. So I think that the rules again are very high. They could be cumbersome to implement and we’re looking at a world where this is some sort of an insurance policy. Why do we talk about quotas when we didn’t have quotas 25 years ago? The only way to understand that is we’re entering a new more protectionist world. So this sort of a sthe new agreements insurance policy provision. That’s the way I see it. AMT: Christine McDaniel, you’ve said you’ve had mixed feelings on this. How so? CM: Well I think you know the North American auto industry has been a relatively competitive on a global scale, but US, Mexico, Canada, automakers in the region, they need access to globally competitive priced inputs. You know I mean if was profit maximizing for them to have you know done some of these things in the past, then they would have been doing that. So you know this is you know putting a restriction on how much you know particular firms in a particular sector must pay their workers, restrictions on where they can get their inputs, at what price and how much. You know these are things that will restrict automakers in the region. You know in a time where you know the real growth is in Asia, so we want a strong competitive globally competitive automotive sector. And these restrictions do not necessarily align with that you know investor confidence. AMT: Colin Roberston, I’ll just get you to be brief on the impact for Canada because I want to go to one more topic too. CR: No, we’ve moved to similar to what we have in lumber, we’ve moved to manage trade in autos. Keep in mind this is something Donald Trump was insistent on and I make the bigger point is that these negotiations were not initiated by Canada or Mexico. This was very much initiated by the United States. I think the fundamental reason is that Canada and Mexico, 75 percent of our trade is with the United States. Only 18 percent or 17 percent of US trade is with Canada or Mexico. So the US exercised, under Donald Trump, exercised that leverage. I think we’ve come out of this OK. Is it perfect? No, but I think we’re in any trade agreement you take wins and losses and I think overall this is good. And you saw the market reaction, the fact we still have continued access to the biggest market in the world, that’s important for Canada Mexico. AMT: Colin Roberston, what about patent protection on certain drug classes being extended another two years. There are concerns that that could really affect provincial pharmacare plans and Canadians buying drugs. CR: I think that’s correct, although the cost of that through and the fact that we act as a bit of a cartel when we buy the drug. So yes there’s an additional two years protection for a particular stream of drugs called biologics. But you’re correct, Anna Maria, is the potential for slightly higher costs over a period of time is there, but mitigated in part by the fact that Canadian provinces who are the sort of administer the health care, do act as a cartel to try and get best prices from those they’re buying from. AMT: Christine McDaniel, we know the pharma lobby in the United States is one of the biggest lobby is that they had to get this deal. What was going on there? CR: Well remember back in our TPP days, they were lobbying very hard for 12 years on data exclusivity protection for biologics. And you know the end of the day, Australia, Canada, Chile, New Zealand, many others, banded together and really blocked that effort by the United States to do that. So the US was not able, it did not look like it was going to be able to do that in TPP. The fact that you know it appears to have sort of twisted Mexico’s arm and then for Canada join in they had it you know reluctantly agree to something that they apparently didn’t want to do earlier. You know that’s I think that’s interesting. Although they didn’t get, US didn’t get the full 12 years, they got 10 years. AMT: I’ve got music coming up. Means we’re running out of time. Thank you all of you for weighing in on some of these issues today. CM: You bet. Thank you. AMT: That’s Colin Robertson, vice president and fellow at Canadian Global Affairs Institute. Antonio Ortiz-Mena, senior vice president of the Albright Stonebridge Group and Christine McDaniel at the Mercatus Center at George Mason University. Stay with us. This is The Current.